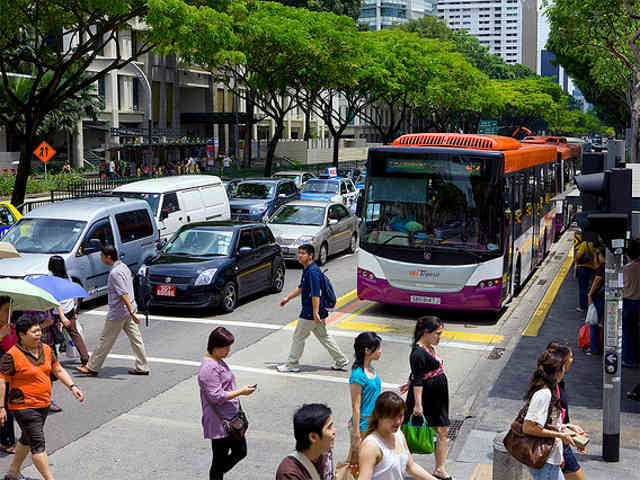 A pedestrian crossing in Singapore. Photo by Scania Group. Each time we travel extra miles in private cars, we emit more CO2, and we create more traffic related deaths and injuries (see data from the International Energy Agency and the World Health Organization). Each year 1.3 million die from traffic crashes on average; and the transport sector currently contributes approximately 13% of annual greenhouse gas emissions worldwide. The CO2 we emit with transport is a function of how much we travel –in kilometers, and of the emission rate of our vehicles -in grams per kilometer. Similarly, traffic crashes are also a function of the exposure -in kilometers driven, and of the level of traffic crashes death risk -fatalities per kilometer driven. While road infrastructure design, better vehicles and other risk reduction measures have proven effective in decreasing the traffic deaths risk, it is important not to overlook the potential for further safety improvements from reducing exposure. We need to reduce distance traveled in private cars, and as we do so, we will also reduce our carbon footprint. We are in a win-win situation when we reduce our travel: less fatal crashes and less CO2 emitted. Most traffic fatalities are preventable and predictable. Most traffic crashes are not accidents and even some traffic authorities have removed the term “accident” from their reports. Reducing traffic fatalities is a matter of making trips safer and reducing the length of individual motorized trips. Sustainable transport, in the form of protected facilities for walking and biking and well designed and operated public transport systems with transport demand management strategies, has the opportunity to provide us with a way out of our problems. Sustainable transport can help reducing trips in individual motor vehicles and making these trips of good quality – less hazardous than driving a private vehicle to work, not only for the vehicle’s driver but for all road users. When looking at the reduction of distance traveled necessary to curb CO2 emissions, the International Energy Agency (IEA) has been looking at different scenarios. The reductions the IEA considers in distance traveled are calculated for their CO2 benefits. They project 151 billion vehicle kilometers saved by 2020, that is a 7% reduction. When we translate the targeted reductions in distance traveled into lives saved, we estimate that the reduced fatalities may be between 103,000 to 126,000 lives saved in year 2020 (the difference comes from different assumptions on risk rates[i]). This is a remarkable reduction, but it is not enough to meet the ambitious targets pledged by the United Nations in the Decade of Action of Road Safety. The UN calls for a 50% reduction in fatalities in 2020 from the 1.3 million accounted for in 2010. If we assume a reduction in the fatality risk per kilometer driven in 5% a year (more than the current trend of 1.95%), distance traveled would have to be reduced by 58%. [ii] This is 8 times the proposed vehicle kilometer reduction projected by IEA. Achieving these reduction targets on distance traveled and risk is not easy, but the synergies of combining the climate change and road safety agendas are clear and can provide incentives for the collaboration of the communities working on these critical issues. If we look closely, and further demonstrate the opportunities of collaborative work, then we can see sustainable transport and urban development initiatives as contributors to both the global road safety agenda and the climate change agenda. Reducing road safety risks requires a complete set of policies and a systems approach as clearly laid out in the Global Plan for the Decade of Action for Road Safety. The actions involve five pillars: building road safety management capacity; improving the safety of road infrastructure and broader transport networks; further developing the safety of vehicles; enhancing the behavior of road users; and improving post-crash care. This involves defining clear targets and working on the different components of the safety issues, as has been suggested, for example in the “Safe System Approach” by the International Transport Forum and the World Bank. Reducing risk through integrated and systematic approaches can continue to be the main target of the road safety policy, but can be effectively complemented with policies to avoid individual motor vehicle travel and shift travel from less efficient to more efficient modes (see for example, the transport chapter of UNEP´s Green Economy Report and the Global Status Report on Road Safety 2013). If more effort is done to reach the Decade of Action road safety target (half of the 2010 road fatalities in 2020) through reductions in motor vehicle travel we can receive huge benefits in terms of reduced energy use and lower greenhouse gas emissions — a win-win situation. For instance a reduction in distance traveled in individual motor vehicles of 58%[iii] as compared with the IEA’s 4-degree scenario, would result in savings of 813 billion tons of oil equivalent and 2,857 million tons of CO2 eq. [iv] The level of energy consumption and GHG emissions would be 60% and 58.5%, respectively, of those in the IEA’s 4-degree scenario. This suggests that an effort on reducing exposure to road safety risks may also significantly lessen our burden on fossil fuels and place the planet much closer to avoiding the catastrophic impacts of climate change. This ambitious goal would have multiple benefits: not only we would escape the most daunting scenarios of extreme weather events, but we would also save hundreds of thousands of lives. We would also expect other improvements in the quality of life in cities resulting form reductions in congestion and in air pollution and eventual increases in physical activity. Thus, several important sustainability goals can be met through the same recipe. This is the challenge and the promise of sustainable transport. The high level estimations indicated in this note should be studied further. There are open questions like the feasibility of reducing motorized travel to the target levels, and the regional differences from developed countries reaching peak travel and emerging nations rapidly motorizing. Also understanding and advancing integrated policies for risk reductions, particularly for sustainable transport initiatives (see, for example Traffic Safety on Bus Corridors: Pilot Version – Road Test). There is also a role for compact, mixed used and accessible urban development in reducing the need for individual motor vehicle travel, among other interesting topics. EMBARQ will continue advancing knowledge on these issues and working with governments, international organizations and initiatives, like the Global Road Safety Partnership, in making the promise a reality. [i] IEA projects travel in 25,452 billion vehicle-km in the 4 degree scenario and 23,678 billion in the 2 degree scenario. The intrinsic fatality rate in 2010 is 71.1 deaths/billion veh-km (from data reported at https://www.healthmetricsandevaluation.org/gbd/visualizations/country). If this rate is kept constant to 2020, the total number of fatalities would be 1,809,590 in the EIA´s 4 degree scenario and 1,683,462 in the 2 degree scenario. That is 126,128 lives saved in 2020.Nevertheless, the assumption of constant fatality rate may not hold, as the historic data has shown improvements over time. If the historic reduction in fatality rate of 1.95% per year observed form 2000-2010 continues during this decade, the risk would be 58.71 deaths/billion veh-km. With this rate the number of fatalities can be estimated at 1,481,531 in the IEA´s 4 degree scenario and in 1,381,990 in the 2 degree scenario. That means a 103,541 lives saved in 2020. [ii] In this hypothetical scenario the risk would be estimated at 43.13 deaths/billion veh-km in 2020 (26.1% less than in the vegetative decline scenario and 39% less than in 2010). With this risk rate we would need to have less than 15,401 billion vehicle-km to have 664,270 traffic fatalities. This a 58% reduction from the vehicle travel projected in the IEA´s 4 degree scenario. [iii] The estimated vehicle-km reduction required to achieve 664,270 road traffic deaths in 2020 with a risk rate of 43.13 deaths/billion vehicle-km. This needs a risk reduction of 5% per year, 2.56 times the reduction rate observed between 2000 and 2010. [iv] For this estimation, we use the intrinsic rates of oil consumption and CO2 eq derived from the IEA´s scenarios, that is 0.0791 tons of oil equivalent per billion veh-miles and 0.2629 tons of CO2 eq per billion vehicle miles. The 4 degree scenario projects oil consumption in 2,031 million tons and GHGs from transport in 6,890 million tons of CO2 equivalents.